Jalpaiguri: The state forest department will install 15 more thermal cameras at the Neora Valley National Park to gauge the tiger population. Nisha Goswami, the divisional forest officer of Gorumara division, said the cameras would be installed by this month. "Because of the strike in hills, we could not carry out work in the jungle. As normality has returned, we have decided to resume the work inside the forest and to keep a close vigil on the tiger population. The cameras will be installed at locations like Rechela, Alubari, Jaributi and Khusum," the DFO said. 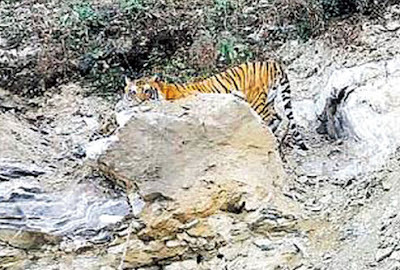 On January this year, Anmol Chhetri, a cab driver, had spotted one Royal Bengal Tiger on the fringes of the forest and had taken its photograph with his cell phone. The incident prompted the forest department to install eight cameras on the next day at different locations of the park. Later on January 23 and on February 15- photos of two more tigers were trapped in the cameras that were installed in Choudaferi and Algarah. This made the foresters decide that more cameras should be installed. The forest, in Kalimpong district, was declared as a national park in 1986 and its present area is 159.89 square km. Many areas of the forest are dense and considered as virgin forests. "It is difficult to keep a close tab of the core areas of the forest. Once the cameras are installed, it would be easier for us to keep tab on the movement of tigers and other animals as well," a forest officer said. The state forest department will install 15 more thermal cameras at the Neora Valley National Park to gauge the tiger population. Nisha Goswami, the divisional forest officer of Gorumara division, said the cameras would be installed by this month.